Stuart Gordon is a tough act to follow. Re-Animator isn’t just one of the best horror movies of the 1980s, but also one of the few rare perfect horror comedies ever made. Alongside Evil Dead 2, the original Re-Animator essentially helped invent the splatstick subgenre and announced Stuart Gordon as one of the most exciting voices in horror. It turned genre royalty Jeffrey Combs and Barbara Crampton into stars overnight. 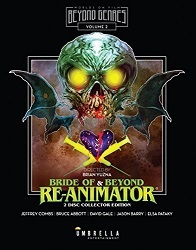 There’s almost no way it could be outdone in a sequel, be it 1990’s Bride of Re-Animator or 2003's Beyond Re-Animator, both of which are packaged together on Blu-ray from Australia's Umbrella Films. Neither one comes close to the heights of the original, though it’s not for lack of trying. Producer Brian Yuzna steps into the director’s chair for the Bride, which finds med student Dan Cain (Bruce Abbott) and Dr. Herbert West (Jeffrey Combs) escaping to Peru months after the bloody and tragic events of Re-Animator. They continue to conduct their reanimation experiments on soldiers injured and killed in the midst of a bloody civil war, but they are chased out by the enemy. Returning home to their original house and hospital, the pair resume their work and West discovers he can re-animate individual body parts. Inspired to create an entirely new person from revived tissue of the dead, West promises Dan that he will reanimate the heart of his lost love in turn for his help (inside the body of Kathleen Kinmont, no less, so of course I'm on board). When a new romantic interest (Fabiana Udenio) and a nosy detective (Claude Earl Jones) make their work more difficult, things really get interesting -- and that’s not to mention the reanimated severed head of Dr. Hill (David Gale) coming back to exact revenge. As much as I love the idea of continuing the adventures of Dr. Herbert West in theory, the sequel devised by Yuzna and fellow screenwriters Rick Fry and Woody Keith somewhat misses the mark. Given the events of the previous movie, the friendship between Dan and Herbert doesn’t make much sense, nor does Dan’s arc throughout the sequel—at times he seems slightly mad with grief, at others he’s casually back in the dating pool. The title and the basic hook, borrowing from Mary Shelley and James Whale, are genuinely inspired; unfortunately, it takes until the final act of the movie for that inspiration to pay off. Bride of Re-Animator spends a lot of time spinning its wheels, coasting on our familiarity with certain characters while failing to make any of the new characters register. Believe it or not, it’s the relationships between the people that make Re-Animator work, whether it’s the romance between Dan and Meg (Crampton), the father/daughter connection between Meg and Dean Halsey (Robert Sampson), the creepy lust Hill has for Meg, or his professional rivalry with Herbert West. Bride doesn’t have any of that emotional spine, and even the central and most familiar relationship -- between Dan and West -- is more or less ignored as each goes on his own separate adventure. But then all the threads come together in the climax and Bride of Re-Animator redeems nearly all of its previous missteps. Like he had previously done in his directorial debut, Society, Brian Yuzna pulls out all the stops in the final act with a set piece that continues to top itself with gory special effects and general insanity. Bodies fall apart, tissue is rejected, the undead attack, and heads literally fly around the room on wings. The makeup effects by a team of all-stars including Howard Berger and Robert Kurtzman of KNB EFX Group, Screaming Mad George, and John Carl Buechler, are nothing short of incredible: stomach-churning and messy, imaginative and surreal, especially in the unrated version. Few horror films nowadays are this willing to completely go for broke, often for budgetary reasons (there just isn’t the money to stage the kinds of effects Bride pulls off), but also because some corners of horror have become homogenized. Whatever criticisms can be leveled against Bride of Re-Animator, it can’t be accused of playing it safe. It would be more than a decade before Herbert West would return to the screen, this time without his partner in crime. After a prologue that finds him being arrested for his experiments, the movie jumps ahead 13 years, during which time West has been conducting his experiments in prison. 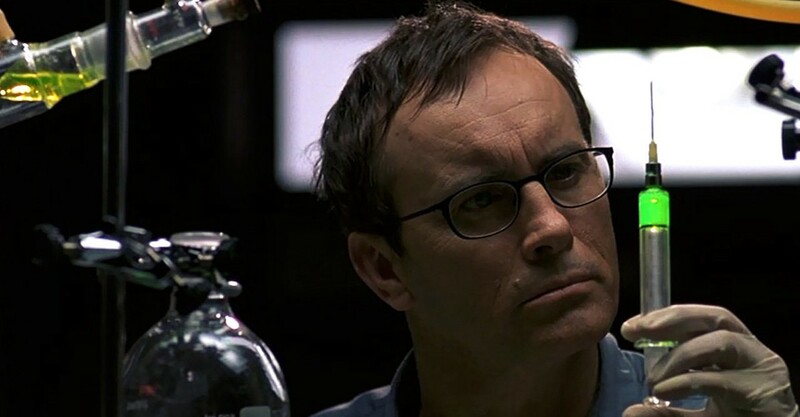 Having discovered a new way to revive the dead (it has something to do with electrocution), West realizes that by combining his new method withe OG green re-agent serum, he can finally achieve his dream of reviving brain activity in addition to dead tissue. Enlisting a prison doctor (Jason Barry) as his assistant, West gets back to work, but the arrival of a journalist (Elsa Pataky) to the prison complicates matters. It's only a matter of time before the body count starts to rise...and then rise again, and again, and again. One of several Spanish productions made during Yuzna's "Fantastic Factory" period, Beyond Re-Animator is probably one sequel too many for the franchise. It feels like a movie Yuzna needed to make in order to keep the lights on at Fantastic Factory, not because there's any more of Herbert West's story to tell. For most of its running time, he prison setting is drab and fairly uninteresting, in particular because Yuzna seems determined to follow a half dozen subplots and makes Herbert West practically a background character. The central romance between Jason Barry and Elsa Pataky only echoes the Dan/Megan relationship from the original movie, with an evil warden stepping in for Dr. Hill as the antagonist. The major difference this time around is that we're not afforded the opportunity to invest in any of these characters, not even those meant to provide the emotional core. They might as well be the young lovers in a Marx brothers movie for as much as we're able to care about them, these placeholders for romantic leads. To be fair, Elsa Pataky's character does eventually have sort of an interesting arc, following the logical progression of where the experiments have been heading throughout the series. Neither the execution nor the resolution add up to much, but at least there's an idea there. If Beyond Re-Animator has anything going for it, it's the final act when the movie is able to totally cut loose and go nuts. It's here that the prison setting finally earns its place, creating more chaos and a higher body count. The finale of Beyond is larger in scale than anything in the entire Re-Animator series, even if it contains fewer memorable moments than both of its predecessors. After the relative small stakes of Bride, Yuzna is clearly enjoying the opportunity to make all hell break loose this time around -- even if what's actually at stake is exactly the same as in the previous two movies. I won't go so far as to say that the last act of the movie is redeems what came before, but it's just about the only stuff in Beyond that really works. For those who missed out on Arrow's special edition of Bride of Re-Animator or who are completists and need to own Beyond on Blu-ray too, Umbrella's double feature set has you covered. I wasn't able to do a side-by-side comparison and can't speak to how this transfer stacks up against Arrow's (it could be the same master for all I know), but both films look and sound quite good in high def, revealing just how good the effects -- particularly in Bride -- really are. A huge number of extras have been included, though again most of the good stuff is devoted to Bride, with Beyond including a lot of EPK-style interviews and not a whole lot else. You can pick up this double feature set for less than it costs to buy just Bride of Re-Animator from Arrow, so if you consider Beyond to be a giant bonus feature, you're really coming out ahead. I wouldn't consider either Bride of Re-Animator or Beyond Re-Animator to be essential viewing for horror fans, even though I think both are worth a look. Bride represents an honest attempt at making a follow-up to a classic and shows off some amazing makeup and gore effects from a real all-star team, while Beyond is best viewed as a sample of Yuzna's Fantastic Factory days in Spain (though I would argue that Stuart Gordon's Dagon, produced by Yuzna, is a more ambitious and successful effort from the same period). For fans, completists, or just the curious, Umbrella's double feature package is an excellent release and a good deal. Featurette: "Brian Yuzna Remembers Bride of Re-Animator"
Featurette: "Splatter Masters: The Special Effects Artists of Bride of Re-Animator"
Featurette: "Getting Ahead in Horror"
Featurette: "Special Effects Artists Behind the Scenes"
Featurette: "The Making of Beyond Re-Animator"